Amidst all the smoke and glitter on our trip to Las Vegas, we made a point of visiting the Hoover Dam, a crowning achievement of mankind. 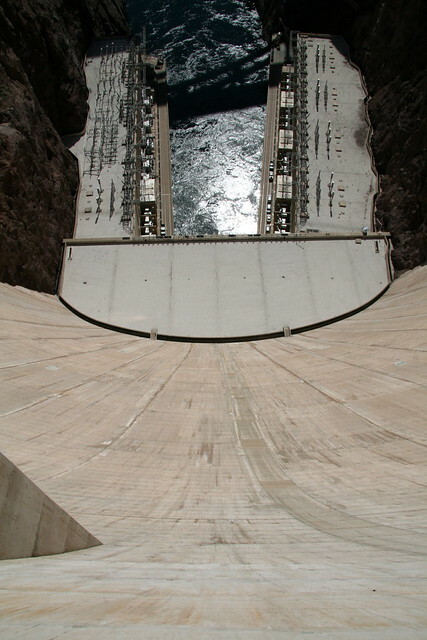 The majestic curve of concrete seamlessly integrated into the beauty of the terrain, mixed with the sheer power of the water, left us completely in awe. Sure, the Hoover Dam isn't the largest dam in the world, and it doesn't have goats precariously licking salt off the walls, but it was still one of the most amazing things that I have ever seen. Then again, it was too amazing for me to take decent photographs, but here goes. We didn't go up to the bridge to take pictures, so this was my best attempt of capturing the width of the dam from the side. 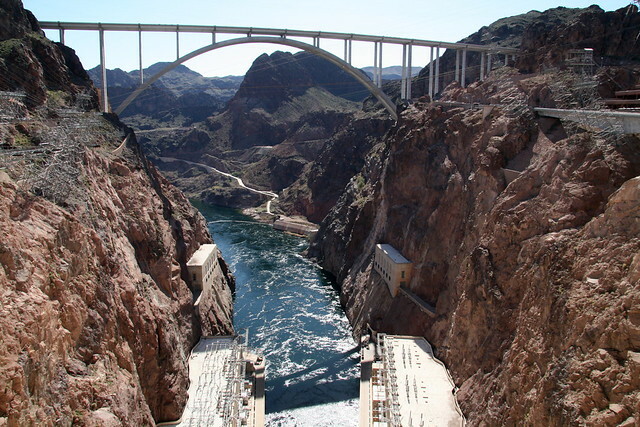 We didn't realize that the Mike O'Callaghan-Pat Tillman Memorial Bridge only opened to traffic last October. What a view it must be from there! We were way too tired by the end of our visit to make another trek over the bridge. Thankfully, the weather was a perfect 75F in March and not the scorching desert heat of summer. Even the Visitor's Center was melded perfectly into the mountainside. I loved the mix of rock, concrete, copper and power lines. 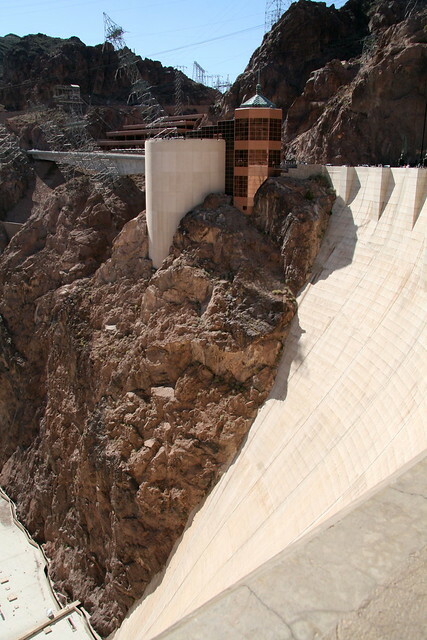 On the other side of the Hoover Dam is Lake Mead, which was created by the dam. I can see why they call it Tapestry Wall. 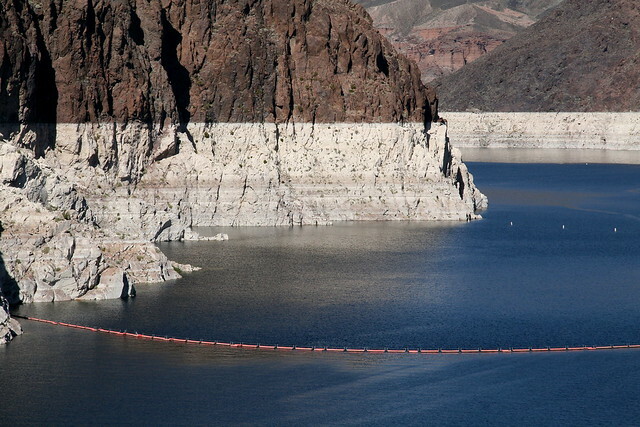 The dam crosses between Nevada and Arizona, which are in different time zones during standard time but have the same time during Daylight Saving Time (which Arizona does not follow). So while it may look like Doug was pondering having one foot in each time zone, it was actually the same time while we were there. 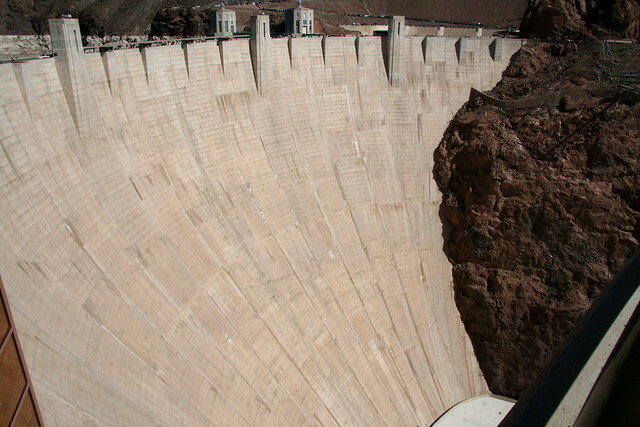 But my favorite thought was, "Wow, this would make an awesome slide," when looking down the wall of the Hoover Dam. Inside, we opted for the Power Plant tour for $11 each instead of the full dam tour for $30. Later we heard other visitors rave about the full tour, so next time! 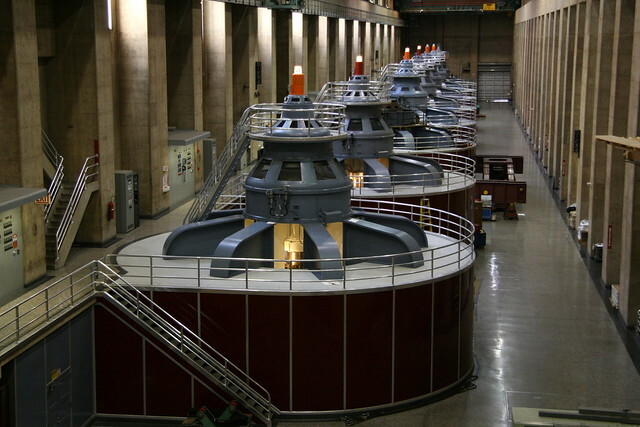 The engineer in me got all revved up over the huge generators (pun intended). Look, they were really spinning and producing tons of clean electricity! No kidding, the rotors and stators on these generators were huge! 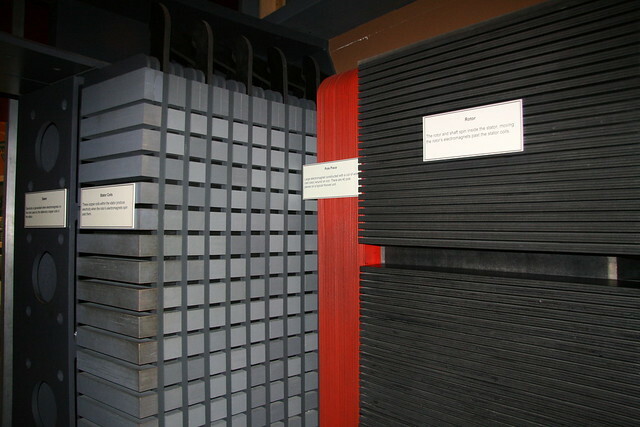 And no, we didn't see the Transformer's Cube there. 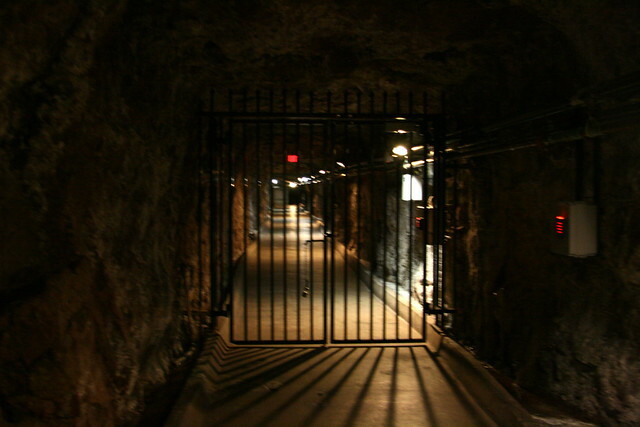 There were warnings for people who experienced claustrophobia, and the tight, dark tunnels were some of the reasons why. The tour elevators were quite crowded as well. Doug felt it was unfair that they didn't list the reasons people may feel claustrophobic up front. 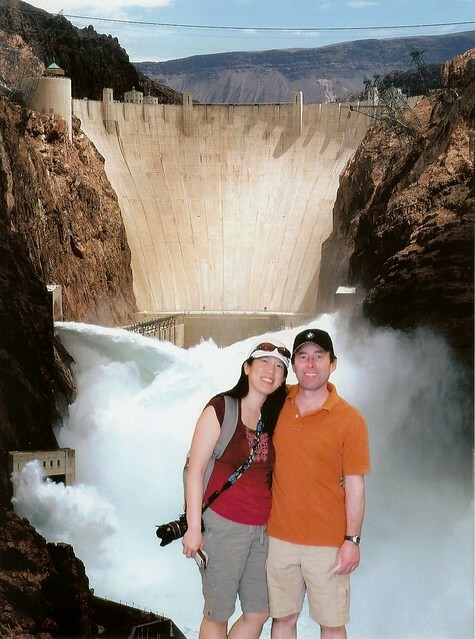 In the end, the best shot of Doug and me in front of the dam was this silly green screen portrait. 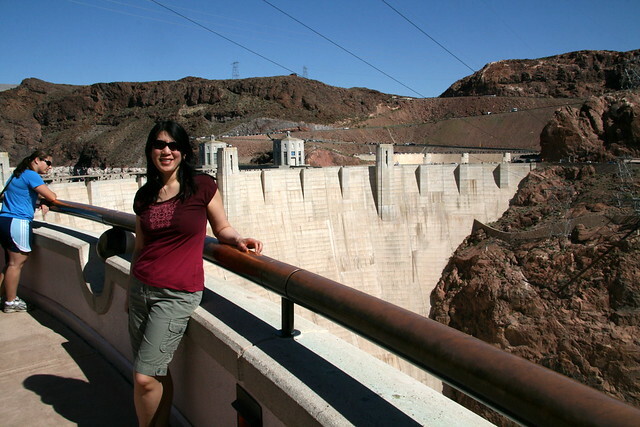 If you're ever in Vegas, don't miss the Hoover Dam. It will be worth your dam while. Beuatiful photos! 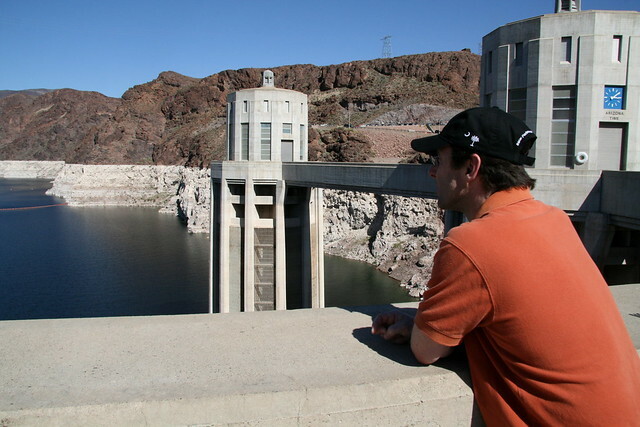 I enjoyed Your unique view points about Hoover Dam.